The Fearey Group has been an independent firm in Seattle for more than 32 years. The firm has provided communications services for some of the region’s leading public, private and non-profit organizations and has strong practices in the areas of healthcare, public affairs, biotechnology, built environment and land use, finance, transportation, nonprofit, consumer marketing and crisis communications. The purpose of their blog, “Fearless Thinking“, is to offer insight about communications and public affairs programs and campaigns while offering up some of their fearless thoughts. 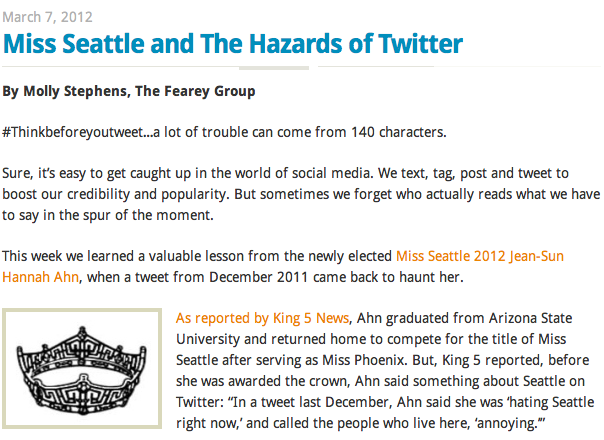 Their blog is maintained by all levels of staff at The Fearey Group.